Baseball fans everywhere – especially those of the Boston Red Sox – are fond of slugging infielder Rico Petrocelli. Maybe it’s just the catchy name, but Petrocelli starred for the Red Sox for 13 seasons from 1963 to 1976 – making two All-Star appearances and playing in two World Series. But for all the success he’s had on the baseball diamond, it’s been Petrocelli’s Catholic faith that has defined his life – both on and off the field. His journey includes overcoming a major hurdle, but he emerged as a stronger person and a stronger Catholic. Americo Peter “Rico” Petrocelli – the youngest of seven children to Attilio and Louise Petrocelli – was born near Coney Island in 1943. His family moved to Bedford-Stuyvesant, where he attended St. John’s Parochial School, and then to Flatbush, where he went to St. Thomas Aquinas Elementary School. Surprisingly, Petrocelli did not start playing baseball until age 12, just a few years before he entered Sheepshead Bay H.S. He wound up winning the M.V.P. award for the St. Mark’s parish, Sheepshead Bay, Catholic Youth Organization baseball team that won the league championship. At the awards ceremony, Brooklyn Dodgers’ legendary first baseman Gil Hodges presented the young Petrocelli with the award and one of his bats – which Petrocelli said was as big as him. Petrocelli was then hooked on baseball and became both a Dodgers and New York Yankees fan. In high school, Petrocelli was a star pitcher and outfielder, but he also excelled on the basketball court at Sheepshead Bay and in a semi-pro independent football league based out of Gerritsen Beach. 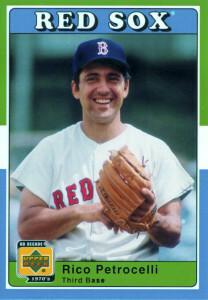 Upon graduating in 1961, Petrocelli was signed by the Red Sox as an 18-year-old. 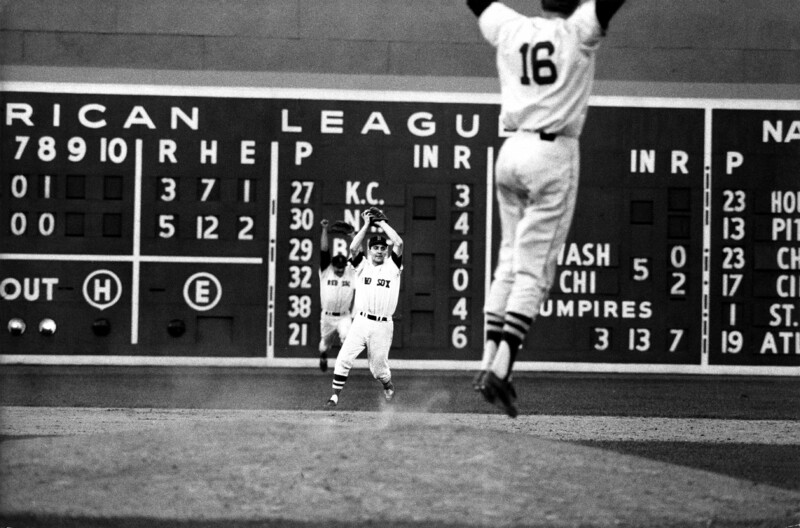 At that time, Boston was going through a rebuilding phase, which allowed Petrocelli to advance quickly through the minor leagues and make his professional debut in 1963 at age 20. 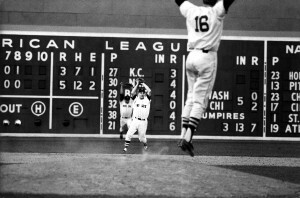 He experienced early success for the Red Sox – playing in the 1967 All-Star Game and World Series. Two years later, he clubbed 40 home runs, which set the MLB-record for shortstops – since broken by Alex Rodriguez’s 57 home runs with the Texas Rangers in 2002. The following season, Petrocelli drove in a career-high 103 runs. For his career, the shortstop – who later converted to third base to make room for Hall of Fame shortstop Luis Aparicio – had a .251 batting average with 210 home runs, 773 RBI and .976 fielding percentage. He was inducted into the Red Sox Hall of Fame in 1997. Early on in his playing career, Petrocelli practiced his Catholic faith often. In addition to attending weekly Mass, he frequently engaged in community service projects in the Archdiocese of Boston. However, a few years after he made his debut, he began losing touch with his faith. He married his wife Elsie when both were just 19 years old, and he soon had four small children: Michael, twins James and Bill, and Danny. At that time, Petrocelli’s sole focus baseball and providing for his growing family. Faith took a back seat until 1969, when Petrocelli and his wife were at a team function and Elsie started bleeding. After being rushed to the hospital for a biopsy, Elsie found out that she had uterine cancer. Here’s a professional baseball player who had just received M.V.P. votes the previous season, yet just a month after his fourth son was born, he received this tragic news. Petrocelli said that sometimes ballplayers may seem like they’re protected from the real world in a bubble, but the bubble for Petrocelli and his family burst abruptly – when he was just 27 years old. After a successful partial hysterectomy, doctors told Elsie that if five years passed without a recurrence, she would likely be cancer free for life. However, the very chance of losing his wife to cancer sent Petrocelli spiraling in a downward depression. Petrocelli’s depression hit rock bottom in May, 1974 – which was only a few months until the five-year estimated term for Elsie would come to an end. Petrocelli’s prayers were answered but certainly in an untraditional way. One day at Fenway Park before a game, a gentleman named Pat Jantamosa somehow snuck unnoticed past security and into the Red Sox clubhouse. He meant no harm but was instead a non-denominational seminarian and die-hard fan who went up to a few players and told him he was praying for them. Many of the Red Sox ballplayers just shunned him away, but Petrocelli took a special interest as he had been looking for a sign from God since kneeling with his wife to pray. The two agreed to meet after the game for a cup of coffee right before Jantamosa was removed by security. Jantamosa met Petrocelli after the game and told the Red Sox slugger that his eight-year-old son had cystic fibrosis and that he and his wife also got down on their knees to pray for God’s help. The two met frequently, and Jantamosa would even travel with the team on road trips – paying out of his own pocket. He tried to set up a prayer service with some of the players in the team hotel, but at first, only he and Petrocelli showed up. But soon, outfielder Dwight Evans and infielder Denny Doyle became regulars. By the end of the 1974 season, a group of 14 people, including players, coaches and even media personnel, met frequently to pray. Petrocelli had committed his life to God, and he began to trust that God would keep his wife safe. Sure enough, Elsie’s cancer has never returned. Petrocelli has remained close with Jantamosa, whose son with cystic fibrosis is now happily raising a family of his own. These days, Petrocelli resides in Nashua, N.H. He’s involved with Petrocelli Marketing Group, which sells customizable promotional products and shirts. He also gives corporate speaking engagements and appears at Red Sox events. Looking back, the Red Sox fan-favorite realizes that he owes everything to God, especially enjoying his life with his No. 1 fan, Elsie – his wife of now 48 years. If he keeps putting his faith in God, he’ll be able to spend another 48 years with Elsie.